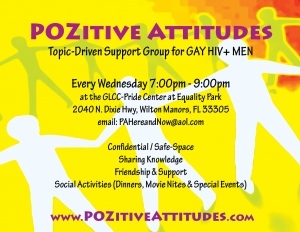 This Web Site is meant to share information of HIV Gay life in South Florida as we know it. By using this website, you agree that you have read the Website Disclaimer and agree to the exclusions and limitations of liability set out in the Website Disclaimer are reasonable. Subscribe to this Website by going to the box to the right that say EMAIL SUBSCRIPTION. Type your emailaddress@something.com into the box and then hit SIGN ME UP. This will generate an email to the emailaddress you entered. Go there, open that email and CONFIRM YOUR SUBSCRIPTION. Too many emails? If you don’t want an email everytime I blog, every email sent to you will have a MANAGE SUBSCRIPTION at the bottom. After clicking on that, you will see an an area that says “Delivery frequency”. The arrow will give you three options: “Immediate” for an email for every blog, “Daily” for 1 email per day or “Weekly” for 1 email per week. Make your selection and hit SAVE CHANGES. We want to keep you signed up even if you only look at our site once a week. Thanks for your support of this site.